A sign has been placed on a stretch of roadway in southeast Missouri to honor a Korean War soldier. Those traveling east and west on Highway PP in Poplar Bluff can view the sign that reads “Pvt. 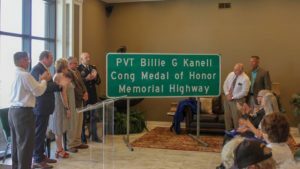 Billie G. Kanell, Congressional Medal of Honor Memorial Highway”. In 1951, Kanell was among a group of soldiers who came under heavy enemy fire in Pyongyang. A grenade was thrown at them and Kanell jumped on the explosive to protect his fellow soldiers from the blast. A few seconds later, another grenade dropped in their location. Kanell, who was seriously wounded, rolled himself on top of the second grenade. The sequel killed the 20-year-old Poplar Bluff Army Private who went above and beyond the call of duty that day. Overlooking Highway PP, about 75 people packed into New Covenant Church in Poplar Bluff on Tuesday for a special ceremony to unveil the sign. Family members, the city’s mayor, members of the military and southeast Missouri Republican Congressman Jason Smith were among those in attendance to hear a military gun salute and Taps echoing throughout. Rob Callahan tells Missourinet he and two others have been working on the sign project for at least two years. With the help of Tucker Davis and Jeff Schawn of Poplar Bluff, they raised money in the community to fund the sign. Callahan says the roadway was named years ago after Kanell but he wanted to bring attention to the soldier putting his life on the line for America. Kanell saved at least two comrades during that September 7th day. “We don’t know who they are. We don’t know who their sons, their grandsons or what the extended family members have done with their lives. But, they were able to do what they did because of Billie’s sacrifice,” Callahan says. Kanell, who is buried in nearby Fairdealing, is one of nine children in his family. His childhood home still stands in Poplar Bluff.